Calculators can help you solve an infinite amount of math problems in an instant. This makes them incredibly useful tools. However, if the user is a young child who's barely learning math, using a calculator may not be the best thing. This is because it can hinder their math learning process, and keep them from doing math calculations correctly on their own. So a calculator doesn't get in the way of your child's math skills, read the tips mentioned below. Call The Tutoring Center, Parsippany NJ at (973) 884-3100 to enroll your child in one-to-one math tutoring in Parsippany NJ. Needless to say, the first thing on your agenda should be to help your child learn basic math (both concepts and operations) before you even think about introducing a calculator to them. For instance, they should be able to understand what additions, subtractions, multiplications, and divisions are. Moreover, they should be able to do them (even long ones), on their own correctly and comfortably. Only then can you tell your child to use a calculator. This way, you can guarantee that its use won't get in the way of an effective math learning process. Using a calculator may be the easiest way to do math operations. However, it is not the only way to get them done. In fact, nowadays, there are few different methods your child could use to solve their math problems, while they sharpen their math skills. For example, you can give your child an abacus, so they can move its beads around in order to calculate their math operations. Even a simple piece of paper and a pencil can help your child do math and work on their skills properly. Something you shouldn't overlook, however, is that you shouldn't let your child use their fingers to count or work on their math calculations. This is because they can also develop a dependency on them that could get in the way of their math learning efforts. As you're probably aware, children like being treated respectfully, and to be considered. For that reason, you should try a different approach: talk to your child about calculators. Doing so may mean that they'll listen to you and will know to use their calculator with care. Furthermore, through your conversation, you can help them understand why it is important that they know how to do math on their own. Let them know, for example, that there will be situations in which they won't be allowed to use a calculator (like when they're answering a test). Doing math by themselves will help them complete their duties without facing negative consequences. 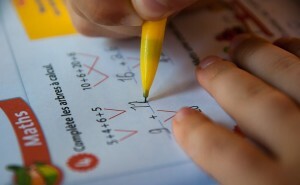 Help your child do math successfully with one-to-one tutoring in Parsippany NJ. Call The Tutoring Center, Parsippany NJ at (973) 884-3100 to schedule a free diagnostic assessment. Depending on your needs, you can find a calculator that suits them best. There are basic, standard calculators, scientific calculators, graphing calculators, financial calculators, among others. Still, it's highly likely that your child won't benefit from advanced calculators just now (unless they're a math genius). In fact, giving them a scientific or graphing calculator may confuse them and make them intimidated. For that reason, right now, the best option for them is a basic, standard calculator. Before handing it off to them, however, make sure that they understand its buttons, what they're for, and how to work the calculator effectively. One last thing you should teach your child about calculators before they can begin using them is the limits they should have with it. Setting boundaries will help you ensure that your child will only use the calculator when absolutely necessary, so it doesn't become a crutch that they rely on too much. For example, allow them to use their calculator after they're done working on their math operations on their own. This will give them the chance to verify the work they already did, as well as correct any mistakes they could have made, which can ultimately help their math learning process. Call The Tutoring Center, Parsippany NJ at (973) 884-3100 to enroll your child in one-to-one tutoring in Parsippany NJ, or to ask about their academic programs.